“Learn to Curl” sessions at the Milwaukee Curling Club are the perfect way to introduce yourself to this fantastic winter sport. These sessions will take you from off the street to game ready in just two hours. We recommend you arrive about 15 minutes before the session to register, prepare your equipment and tour our club. Please be prepared for temperatures of about 40 degrees. In addition to a light coat or sweater, wear comfortable shoes. Light weight hiking or tennis shoes will work just fine for your first expedition curling. Once your gear is ready we’ll send you right on the ice. You’ll get a feel for the ice surface, which isn’t anything like ice skating, and we’ll show you around a sheet of curling ice. Before too long we’ll show you how to deliver a stone, the ins and outs of sweeping, scoring and strategy. Those are a few of the many aspects that make curling fun and great exercise. After about one hour of the basics, we’ll divide into teams of four and scrimmage against the other participants in the “learn to curl” session. Two hours after it starts you’ll be ready for another great curling tradition, the post game camaraderie. You’ll visit for a while and tell war stories while we give you information on joining the Milwaukee Curling Club. Nearly 100% rate the overall experience Excellent or Good. Over 95% rate the instructors Excellent or Good. Over 93% rate the cost Perfect. 95% rate the food/socialization afterwared Excellent or Good. "Instruction was EXCELLENT! We REALLY enjoyed the experience!" "Loved our instructor. The timing and ordering of everything was perfect." "The friendliness and knowledge of the instructors was amazing." "Fantastic experience, will definitely recommend to our friends." "The instructors were awesome. They knew their stuff and were patient and very encouraging." "Great environment and wonderful people." "The price for 2 hours of curling, food and drinks. Great deal!" Very good instruction for newbies. Had a lot of fun, and recommending to my friends! 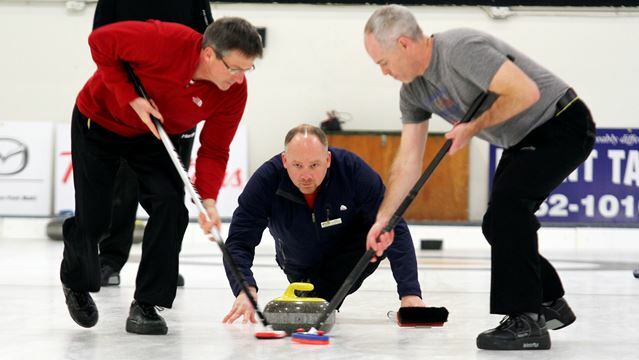 The Journal Sentinel says Learn to Curls at the Milwaukee Curling Club are a fun activity that will not break the bank. Read the Learn to Curl article. Other photos from previous Learn to Curls can be seen on the Milwaukee Journal Sentinel web site.